We are delighted to announce that we have a new sponsor supporting the Cockleshell Endeavour – Patron Capital. Keith Breslauer, the Managing Director of Patron Capital, is an accomplished mountaineer with a strong connection with the Royal Marines. 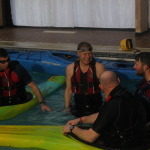 He’s kayaked across the English Channel with the Royal Marines as part of the 1664 events last year (The Corps 350th birthday events), and Keith is also a trustee for the Royal Marines Charitable Trust Fund (RMCTF). The support Keith and Patron Capital will be giving the Cockleshell Endeavour will go a long way in ensuring the success of the project, raising money for Care After Combat and awareness of PTSD. “Patron is proud to sponsor The Cockleshell Endeavour Project. Mick Dawson and Steve Grenham are two former Royal Marines bringing awareness to some of the mental health issues facing members of the service and ex service community, in particular those issues surrounding PTSD. There’s no denying that the Cockleshell Endeavour is an incredibly physical challenge, one that will push Mick Dawson and Steve Grenham to their limits. Not only will the pair have to kayak the 650miles of gruelling Falkland Island coastline in 2016, but they have faced some incredibly tough training paddles, with four more ahead of them before they tackle the Falkland Islands in 2016. But the goals of the project reach far beyond the physical though; Mick and Steve plan to use the challenge to highlight and explore the issues of Post-Traumatic Stress Disorder amongst the former military community. Steve Grenham has been fighting a long battle with the condition and has struggled to find an effective treatment. It is hoped that the Cockleshell Endeavour will create a structure and purpose that will help him on the road to recovery as he meets the incredible demands of this challenge, whilst also putting a spotlight on the hugely relevant subject of PTSD as a whole in the service community. Over the next 12 months we hope to use the Cockleshell Endeavour as a central point of information for people looking for help, advice and information regarding the issues of PTSD. We will be inviting people working in the field of PTSD or with experience relating to PTSD to contribute articles for our website and in time create a library of useful information and contacts. We can’t think of a better individual to invite to begin this process than Dr Dave Jackson (third from left in the main picture), who was one of the first PTSD professionals the Cockleshell Endeavour team was introduced to. We have corresponded at length over the past few months and he’s supplied the team with a whole host of information on the subject of PTSD. Dave attended the launch event earlier this year where we discussed the issues of PTSD, how it’s perceived, advances in it’s diagnosis and treatment at length. Dave has great personal experience in the area of PTSD, not least as he’s had to personally deal with it’s effects after his experiences in the Falklands War. Many of the points Dave brings up when analysing the issues of PTSD certainly struck a chord with Mick and Steve, particularly his assertion on the ‘Different Culture’ of the service community. A big thank you to Dave for putting this document of your views and experiences together for us, and we look forward to adding the experiences and views of others as the project progresses. To read Dr Dave Jackson’s full article, please click here. We are really pleased to announce that The Andrew Croft Memorial Fund will be providing us with funding which we will use to purchase two training kayaks – an essential part of our kit for preparation for our circumnavigation of the Falkland Islands in 2016. The Andrew Croft Memorial Fund was established in 1998 to preserve for future generations the life, spirit and hopes of Colonel Andrew Croft DSO OBE, Arctic explorer and wartime commando. The Fund’s objectives are twofold; to support the advancement and education of young people by the provision of grants in support of expeditions, and to assist Her Majesty’s Constabulary with grants towards the cost of further education and training aimed at enhancing their effectiveness in the community. As a result of this generous contribution, one of the training boats used by the Cockleshell Endeavour team will be named ‘The Andrew Croft’ and the fund’s crest will be displayed on the kayak. One half of the Cockleshell team, Mick Dawson, met Andrew Croft’s daughter Julia Korner recently when he was invited to hear the last surviving female World War Two S.O.E. operative in France, Noreen Riols, speak in London. Noreen is an incredible woman and it was an honour to meet her. Her remarkable story is told in her book: ‘Secret Ministry of Ag. and Fish.’ which documents the incredibly dangerous and vital special operations work she and her colleagues carried out during the second world war. Julia Korner, is a close friend of Noreen and accompanied her for the presentation. Mick and Julia discussed the Cockleshell Endeavour and his previous Ocean Rowing adventures and as a result he approached her fathers trust fund for help in the purchase of our two training kayaks. As with all our supporters and sponsors, we are incredibly grateful for the generosity of The Andrew Croft Memorial Fund and look forward to putting this funding to use on the purchase of our training kayaks. Less than four weeks after returning from kayaking the length of the Caledonian Canal, and back, the Cockleshell Endeavour duo, Mick Dawson and Steve Grenham, will be jetting off to Canada to compete in the Yukon River Quest. The race starts on 24th June and will see competitors paddle day and night for 444 miles, stopping briefly for short breaks to refuel. 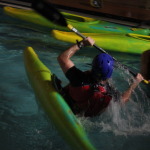 It is open to solo and tandem canoes and kayaks, and voyageur canoes. Mick and Steve will be competing in solo kayaks, but will be joined in the race by Si Reed and Paul Rigby who will also be kayaking the Caledonian Canal with the Cockleshell Endeavour pair. This annual canoe and kayak marathon is touted as the world’s toughest canoe and kayak race and is often called “the race to the midnight sun”. It challenges canoeists and kayakers from around the world to test their endurance on a race from Whitehorse, Canada, to the aptly named Dawson City. Although this is set to be Mick and Steve’s toughest challenge yet, they will get to experience some of the most beautiful landscapes North America has. But is a lot more to the Yukon River than exquisite landscape, as wolves, grizzly bears and moose are often seen at the river’s edge – something for them to be aware of as they head on to land for breaks. The Cockleshell Endeavour team are looking for a title sponsor for the Yukon River Quest. The individual or business who takes up this opportunity will benefit from a number of promotional opportunities, including branding on the boats used for the Yukon River Quest, branding on clothing, promotion via our website and social media outlets and the opportunity to have Mick Dawson speak at a corporate event. For more information about our sponsorship opportunities, please click here. The Cockleshell Endeavour duo are still riding high (or paddling high) on the success of the Devizes to Westminster International Canoe Race but their focus is now well and truly on the next stage of their challenge; kayaking the Caledonian Canal, starting on the 23rd May. But this is the Cockleshell Endeavour, so every training challenge leading up to the Falklands circumnavigation in Spring 2016 is designed to push Mick and Steve to their limits. Kayaking the Caledonian Canal just once isn’t enough for the pair; they plan to kayak the return trip too, against prevailing conditions – not something done by many people. This will also be the first time that Mick and Steve will kayak in separate boats. During the Devizes to Westminster race the pair competed as a pair in a World War Two style klepper kayak. For this challenge and for the remainder of the Cockleshell Endeavour their will each be paddling under their own steam in individual boats. The Caledonian Canal is a man-made canal stretching from Fort William to Inverness. Mick and Steve will be camping out overnight throughout the duration of the challenge, practicing the essential survival skills that will be needed for the Falkland Island circumnavigation next year. Although unsupported, they will be joined by two fellow kayakers, Si Reed and Paul Rigby. This challenge is the second of five training challenges the Cockleshell Endeavour are undertaking in the lead up to the 650 mile circumnavigation of the Falkland Islands in 2016. In June the pair will compete in the Yukon River Quest, followed by a circumnavigation of the Isle of Man and then Ireland. To keep up to date with the Cockleshell Endeavour’s progress Follow them on Twitter or Like on Facebook. Two Brighton based former Royal Marines and Falkland veterans who plan to kayak around the Falkland Islands in 2016 for charity faced their first major challenge this weekend at they competed in the grueling Devizes to Westminster International Canoe Race. Steve Grenham and Mick Dawson began their 125 mile kayak at 10.30am on Saturday morning in Devizes, finishing shortly before 7.30pm on Sunday evening outside the Houses of Parliament. Their official race time was 32 hours, 54 minutes and 24 seconds, and Mick and Steve were placed second in the “Folding Kayak” class. 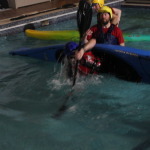 The pair competed in the race in a folding WWII Klepper style kayak. This is a nod to the Royal Marines who died during Operation Frankton in World War Two, later immortalised in the film Cockleshell Heroes. 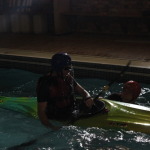 Although the kayak was non-stop, with the duo kayaking throughout the night, they did have to get out of the water 77 times over the route to carry the 70kg kayak over locks. 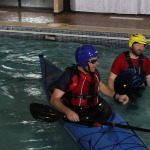 The Devizes to Westminster International Canoe Race is just the beginning of a grueling training regime for Mick and Steve, designed to prepare the Cockleshell Endeavour duo for a circumnavigation of the 650 miles of unforgiving coastline of the Falkland Islands in early 2016 in kayaks. This challenge is set to take about 30 days, will see the Falkland veterans tackle freezing conditions, wildlife including sharks and whales, and unexploded mines left over from the conflict. The four other training challenges are kayaking the Caledonian Canal, The Yukon River Quest in June of 2015, a circumnavigation of The Isle of Mann and then a circumnavigation of Ireland. The Cockleshell Endeavour is not just designed to test the pair physically. Mick and Steve will be using the next 18 months to highlight and explore the issues of Post-Traumatic Stress Disorder. Steve Grenham has been fighting a long battle with the condition and has struggled to find an effective treatment. It is hoped that the Cockleshell Endeavour will create a structure and purpose that will help him on the road to recovery as he meets the incredible demands of this challenge, whilst also putting a spotlight on the hugely relevant subject of PTSD as a whole in the service community. “The Devizes to Westminster was a fantastic event to compete in and it put all the kayaking skills we have gained over the past five months to the test. We were racing against experienced canoeists and kayakers and as novice kayakers it really challenged us. However the support we received from our friends, family and members of the public kept us going. In preparation for their circumnavigation of the Falkland Islands next year, Mick Dawson and Steve Grenham are undertaking a number of kayak challenges, each increasing in difficulty. These challenges, which will include The Yukon River Quest and circumnavigations of both the Isle of Man and Ireland, will kick off next weekend when the boys compete in the Devizes to Westminster International Canoe Race. The Devizes to Westminster International Canoe Race starts in Devizes, Wiltshire, finishing just downstream of Westminster Bridge in central London, opposite the Houses of Parliament. The race has been held annually over the Easter Weekend since 1948. This event, a gruelling challenge in its own right, will see Mick and Steve kayak 125 miles, with 77 portages, in a WWII Klepper style kayak. It is expected to take them over 30 hours to complete, finishing in Westminster on Easter Sunday Evening. However they are racing to make the two hour tidal ‘gate’ at Teddington – if the boys miss the high tide ‘window’ sunday evening they will have an enforced stop until the next high tide and will complete the race in the early hours of Easter Monday. The first 52 miles are along the Kennet and Avon Canal to Reading, the next 55 miles are on the River Thames to Teddington. The final 17 mile section is on the tidal portion of the Thames. Mick and Steve have already kayaked various stages of the route, competing in the Thameside 2 and Waterside C races so are well aware of what’s to come. The Devizes to Westminster is described by the organisers as a severe test of skill, physical and mental stamina and planning which produces a memorable sense of achievement for those successfully completing it. In preparation for their circumnavigation of the Falkland Islands in 2016, Mick and Steve took part in the Thameside 2 preliminary race on Sunday. This race was a nineteen mile and 8 portage section of the Devizes to Westminster race route, a race in which Mick and Steve will compete in just a few weeks. Stretching from Reading to Marlow the guys covered the course in a very respectable three hours,29 minutes and 21 seconds, even more impressive when you consider that they were using the slowest type of boat in the competition. Of course they were first in class though….. Which strictly speaking is one of the great advantages of being the only one in your class…. The event was a great training run and their training partner ‘Riggs took part as well, coming a highly creditable third in his class (helped to some small degree by a mass disqualification on the start line in his group). All in all it was a cracking day and both Mick and Steve are looking forward to the next training session in the build up to Easter’s full on 125 mile Devizes to Westminster race and ultimately the Falklands circumnavigation in Spring 2016. 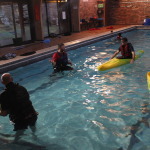 The Cockleshell Endeavour team are one step closer to achieving their goal of kayaking around the Falkland Islands thanks to some expert advice and training from the Outdoor Education department at Plumpton College and the Bowles centre. 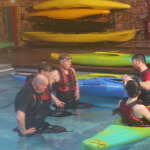 This weekend Alex Hardman, an outdoor education lecturer at Plumpton College, worked with Mick and Steve to teach them some of the kayaking skills that will be needed to complete this tough endeavour. 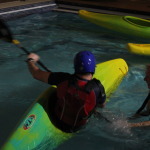 This includes safely rolling the kayaks, ensuring that the pair can right their kayaks if they capsize during the adventure. This could prove to be a lifesaving skill. 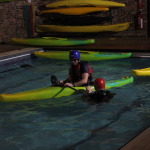 The training took place at Bowles, the outdoor adventure training venue in Tunbridge Wells which donated use of their venue for free, while Alex also gave his time on a voluntary basis and the College provided the kayaks to support the Cockleshell Endeavour. Alex Hardman has a personal connection to the challenge; he is a former Para and is closely involved with HighGround, a charity that was formed to assist in the transition from military to civilian life. HighGround runs Rural Weeks at Plumpton College, a provision that Alex is involved with, and these weeks are designed for Service Leavers, Reservists and Veterans to help them discover employment opportunities in the land-based sector where their military skills and experience match up perfectly. We have already received a large amount of support for the Cockleshell Endeavour from individuals and businesses, but this week we were really pleased to receive an offer of help from a kayak enthusiast based just up the road from us at Plumpton College. Alex Hardman is an outdoor education lecturer at Plumpton College and heard about the endeavour via Mick’s interview on BBC Radio Sussex. 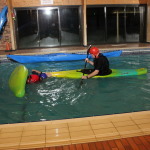 He attended the launch event last week and as a result, has now kindly offered to teach Mick and Steve how to safely roll their kayaks, an important skill for the boys to have when kayaking around the Falklands in 2016. This training will take place on February 14th at the Bowles Centre in Tunbridge Wells, which is kindly provided the training space free of charge. 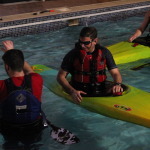 The Cockleshell Endeavour is not just of interest to Alex because of the kayaking element: Alex is a former Para and is closely involved with HighGround, a charity that was formed to assist in the transition from military to civilian life. HighGround runs Rural Weeks at Plumpton College, something that Alex is involved with, and these weeks are designed for Service Leavers, Reservists and Veterans to help them discover employment opportunities in the land-based sector where their military skills and experience match up perfectly. The Cockleshell Endeavour team are very grateful to Alex, Plumpton College and the Bowles Centre for their support with the preparations for the endeavour. If you would like to support the Cockleshell Endeavour, either though the supply of training, equipment or services, or by sponsoring the endeavour, please get in touch.